First, the bad news. About a day after the fourth chick hatched, it died. We're not sure why. This just happens sometimes. The good news is that the other three are doing beautifully, as is mama Emma. 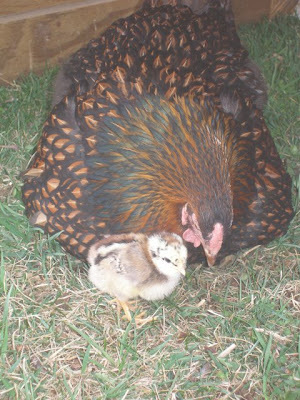 See the LABELS list in the right hand column under 'Broody Hens' to read more about Emma and her chicks. 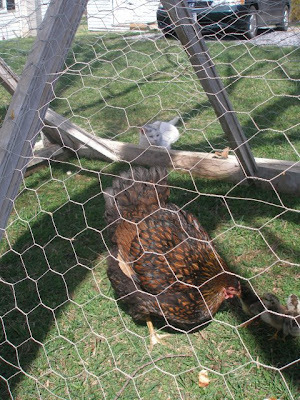 Emma was already teaching them how to scratch and peck in the pen. She would purposefully spill out chick feed from the feeder onto the wood floor and then scratch and peck through the straw, tapping her beak on the floor to show her chicks where the food was. 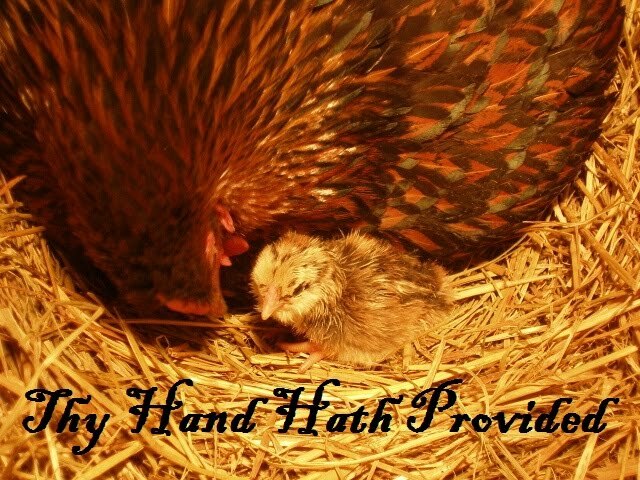 Scratching in the grass and dirt has to be more fun, so we were excited to move them outside and felt confident it was okay since the Broody Hen Wizard gets them outside soon after hatching, too. 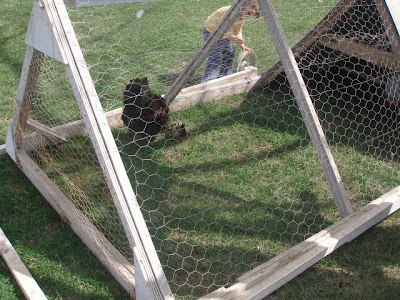 So, on Sunday, we moved Emma and her brood outside into the chicken tractor. 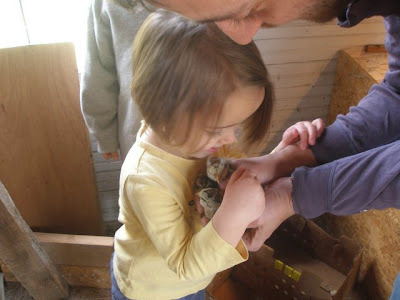 After Jamey carried Emma outside to the tractor, he came in for the chicks. 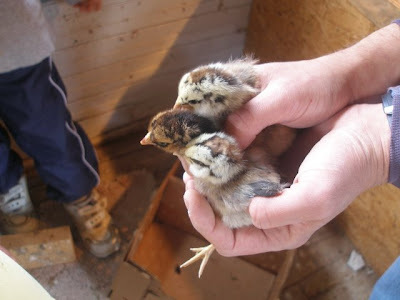 We tried transporting them in a box without a lid, but forgot that six and seven day old chicks can already climb very well. Instead, for fear they would fall out of the box, he scooped them up in his hands. Sadie just had to hug them before he took them outside. 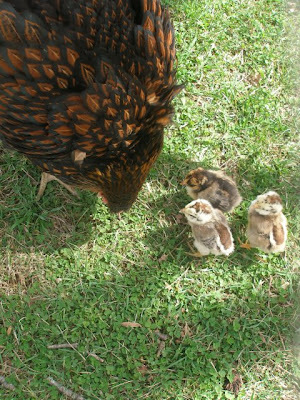 Once they were in the tractor, Emma immediately got to work teaching them how to scratch, hunt and peck in the grass. They were very attentive. 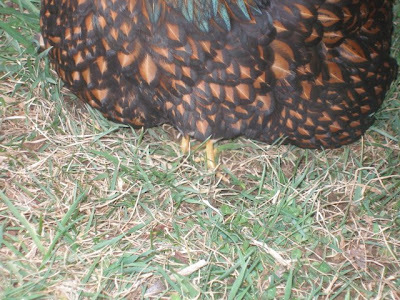 At one point, Emma caught a fly out of the air, spit it out on the ground and tapped at the ground until one of the chicks caught on and gobbled the fly up. Now, let me explain this one. It's the cutest thing. 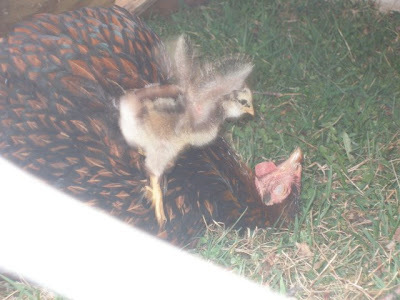 Occasionally, a chick climbs up on Emma's back as if they're playing horsie. 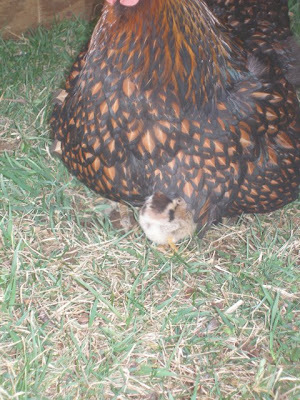 Emma tolerates it for a little while and then rolls her body to the side, gently dumping the chick off. For the life of us, we couldn't get a picture with the chick on her back. So sorry. 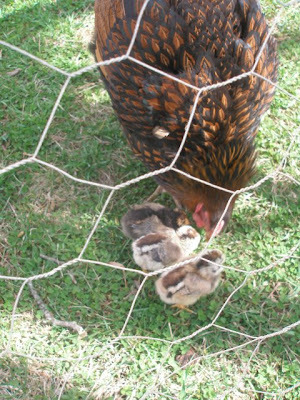 Here's a little sequence for you, showing how these little chicks get in under their mama. Emma appears to be sitting, but she's actually squatting close to the ground to allow them space underneath. Talk about sore quads. The four of us sat outside and watched this little family for about an hour after getting them settled. Somersault enjoyed watching, too. For different reasons, though. Don't worry, they are safe and sound inside. 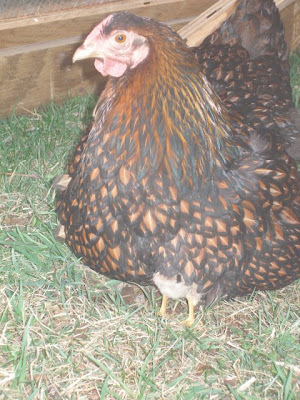 Talk about a chicken picture fix. You should be good for awhile now, right? I love it! They are so cute. SO cute. They look so much happier in the grass, don't they? I cant to get mine out in the sunshine. Soon! MAC, Emma was sitting on a few blue/green eggs. We were trying to remember what those chicks look like- you think they are the chipmunk-looking two? They sure look like Ameraucanas to me, yep. Thanks, MAC, and good luck grafting:-)! Thanks; she accepted them, and is now taking care of (and covering!) 14 peeps. 14 peeps! Wow. Good for her!